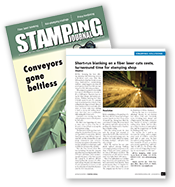 All-New Stamping manufactures precision metal stampings for the automotive industry. Over the years we have seen the automotive industry change, and we have changed with it to continually stay ahead of the demands for higher quality automotive stampings, reduced costs and faster delivery times. Part of this is our commitment to JIT and Kan Ban systems of delivery so you have the parts on the shop floor when you need them. We manufacture parts from micro-miniature electronic components to frame components for automotive bodies. It’s this wide range of expertise that gives us the ability to understand your industry and maximize our manufacturing relationship giving you the automotive stampings you want when you need them. We know the demanding requirements that need to be in all of the automotive stamped parts that we make. In some cases, lives can be at stake and that’s why we take our quality program very seriously. Our AS9100 and ISO 9001 certifications are some of the toughest to get in the business and we have made the investment in our quality so you can have peace of mind that your parts are delivered right the first time every time. Many of our customers work with us on Dock-to-Stock programs which helps them to keep their costs down and their production lines running. At All-New Stamping, our core values of listening to you, providing solutions and maintaining the highest quality certifications bring added value to every part we produce. That’s what Power Satisfaction is all about.